This article will explain the physiology, prevention, treatment and management of hip flexor strains. Each of the following muscles have slightly different functions but overall combine to allow hip flexion, i.e. bringing the knee up towards the chest. This is important when sprinting and kicking. The iliopsoas is often the muscle responsible for tightness in the hip flexors. 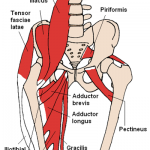 The iliopsoas is composed of two muscles, the psoas and iliacus. These muscles share the same common insertion site on the hip. The psoas muscle originates on the vertebral bodies of the lumbar spine and the iliacus on the iliac fossa (on the pelvis). The tensor fasciae latae originates at the front of the pelvis and inserts into the IT band. The rectus femoris (one of the four quadricep muscles) originates at the front of the pelvis. As with other injuries, hip flex strains are graded from Grade 1 to Grade 3. Grade 1 tear – a small number of fibres are torn. Pain is often present. Grade 2 tear – a significant number of fibres are torn. Pain will be present and there is often a loss of function. Individuals with a hip flexor strain will usually feel a sudden sharp pain or pulling at the front of the hip/groin region at the time of injury. Pain intensity depends on the grade of injury. In some cases, athletes will experience weakness in hip flexion e.g. when climbing stairs, muscle spasm and an inability to continue activity without pain or weakness. Swelling, tenderness and bruising may be noticed at the hip/groin region. Muscle strains commonly occur during athletic competition and in muscles that cross two joints during an eccentric contraction. Strains commonly occur at the myotendinous junction (the part where the muscle and tendon join) and at the muscle belly. 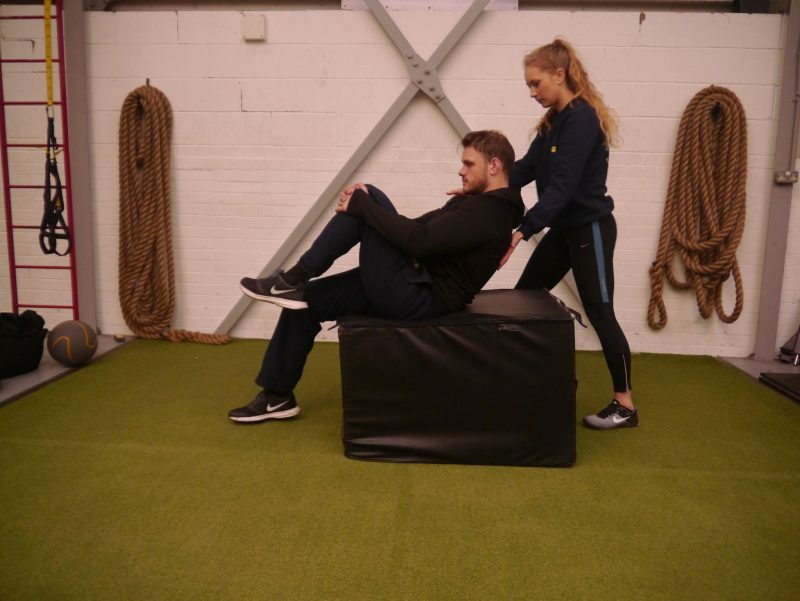 In my experience individuals have strained their hip flexors when they are not properly prepared for their sport i.e.. not warmed up sufficiently and lack sufficient strength for the level of activity they taking part in. Abnormalities in the biomechanical function of the femur can have direct effect on the function of the knee and subsequently cause soft tissue strain. Additionally, research has found that weakness in the hip flexors was associated with patellofemoral knee pain. This suggests that musculature of the hip has control over the femoral rotation during activity. Thus, hip flexor weakness may not provide adequate hip stability during gait to prevent unwanted movement e.g. anterior pelvic tilt. Athletes might find a hip flexor strain occurs following repetitive or prolonged strain in the musculature. It is therefore important to ensure correct programming to not overload. 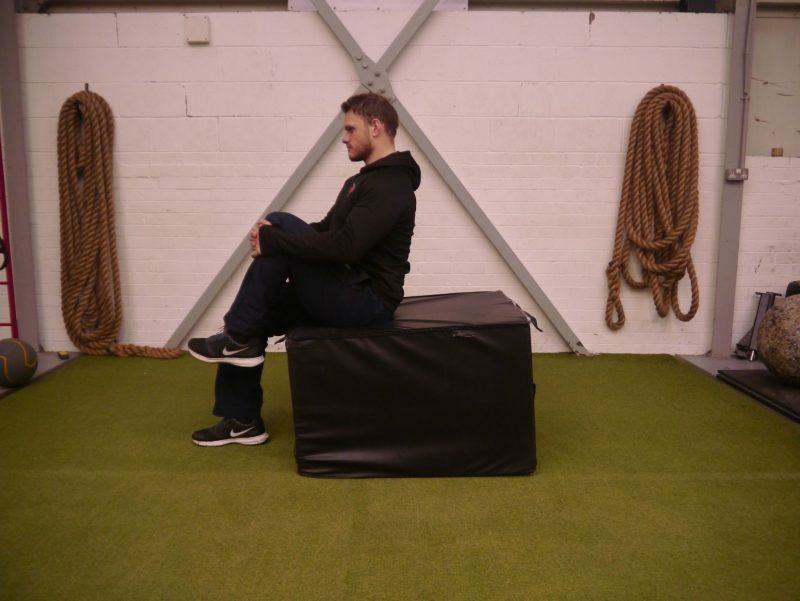 To diagnose if you have tightness in the hip flexors use this test. This hip flexor tightness assessment is called the Thomas Test. 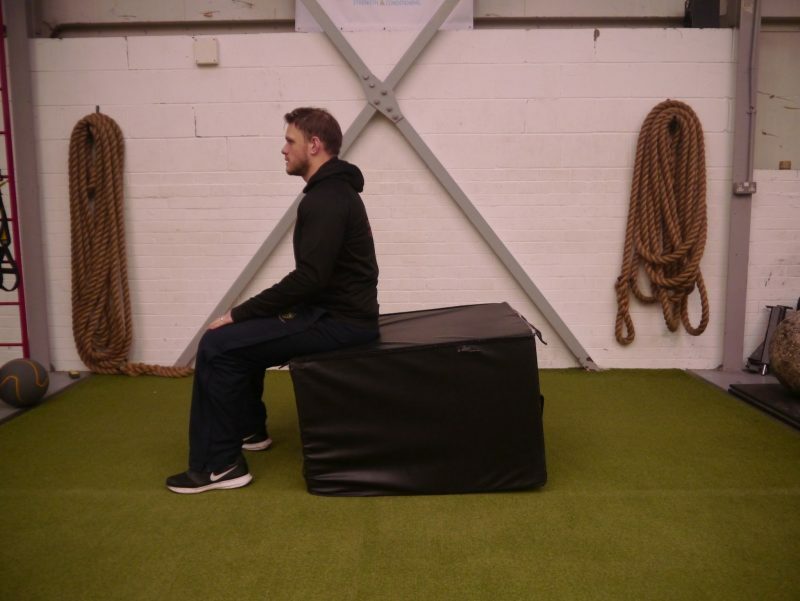 The athlete sits on the edge of a treatment table or a gym box. The athlete should hold one knee up to their chest. 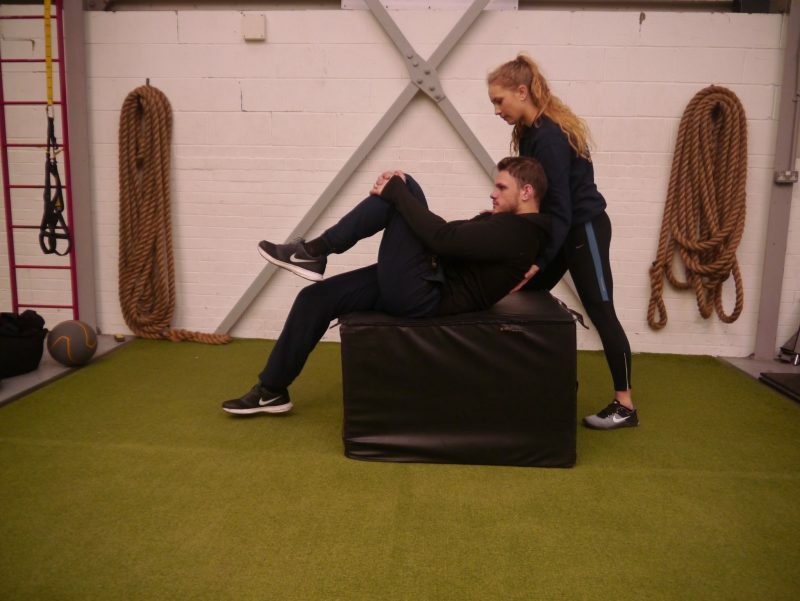 The partner should gently lower the athlete back onto the table and watch the ‘free’ leg. The partner should look to see if the thigh reaches full extension – is the thigh parallel to the ground. If the ‘free’ knee able to bend to 90 degrees of flexion without the thigh rising off the table. If the knee can’t bend to 90 degrees without rising then there is tightness of the rectus femoris. If the knee can bend to 90 degrees without the knee rising but is unable to make full extension then there is tightness at the iliopsoas. Athletes with suspected hip flexor strains should seek medical assistance from a Graduate Sports Therapist or Physiotherapist. Further investigations will diagnose a hip flexor strain such as an x-ray, ultrasound or MRI. Decrease inflammation in the area through use of ice compression and elevation of the limb. Rest from physical activity to allow healing of injured tissue. A rehabilitation programme must then be followed. This will include strength work and stretching. 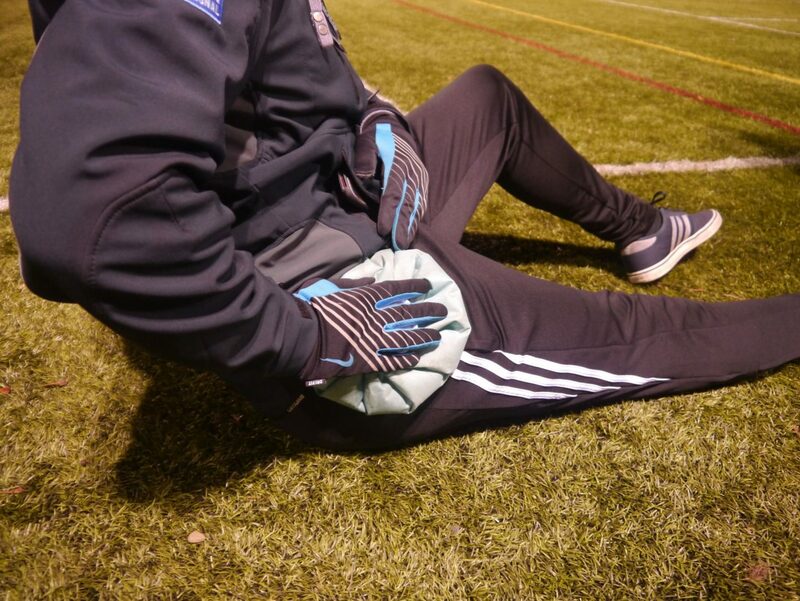 There are a range of treatments which can encourage a speedy return to play. These are dependent on the individual and their injury but include; soft tissue massage, ultrasound, biomechanical corrections, rehabilitation, KinesioTape, stretching and hydrotherapy. Take a look at this video to see some examples of rehabilitation exercises. Prevention though strengthening of appropriate agonist and antagonist relationships (e.g. hip flexor and core), stretching and appropriate warm ups. For a tailored rehabilitation programme please get in contact. Anderson, K., Strickland, S.M. and Warren, R., 2001. Hip and groin injuries in athletes. The American Journal of Sports Medicine, 29(4), pp.521-533. Powers, C.M., 2010. The influence of abnormal hip mechanics on knee injury: a biomechanical perspective. journal of orthopaedic & sports physical therapy, 40(2), pp.42-51.